The cliché of the romantic artist producing master works in fits of inspiration, whilst occasionally holding true, is generally a bad example to follow. If you reckon on one day being seized by the passion to create one of the defining 21st Century artistic statements, you may spend a lot of time doing just that: Waiting! The fact is that true creative genius has to be produced and worked upon - it will not arrive along with the post, and that elusive premium bond win! 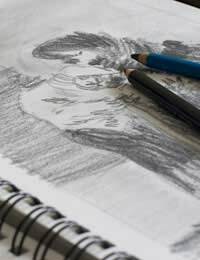 In order to develop a good body of work, ideas must be developed over time: A finished drawing or painting is often the product of many preparatory sketches. Many of these sketches and formulative ideas will develop on the move, others in the studio. In either case, having them all to hand in one 'sketchbook' will help you to chart your development effectively, whilst picking out the ideas that really work from those that pale in comparison. Choosing and buying a sketch book is easy: essentially your main concern will be to choose a quality paper in a sturdy binding, this way your sketches will last over time - you may wish to refer back to your sketchbook months or years after you have worked upon it. If you wish to try some sketches in oil or watercolour then specific 'Oil Sketch' and 'Watercolour Sketch' books can be bought. It is a good idea in this case to have a variety of sketchbooks for different purposes. If using paint in your sketchbook be sure to let the paint dry before closing the pages! It may benefit you, in fact, to remove the pages before painting on them; they can be placed back in a book or 'portfolio' folder at a later point. If using charcoal in your sketchbook be sure to 'fix' your charcoal using a fixative spray, or a hairspray before closing the pages (see related article on charcoal for more details). Once you have chosen a sketchbook it is a good idea to stick to that one format over time. This will make it easier to make comparisons of your work as it develops. You may also wish to have a variety of sketchbooks that you use concurrently of different sizes: one or two pocket size sketchbooks, and a variety of larger ones in order to 'scale up' ideas that occur to you one move. Your sketchbook will really come into its own if you treat it as it should be treated: for sketching! Don't be over-precious with your ideas or preparatory sketches - the best ideas may develop over time from continuous free flowing experimentation. From here ideas can be sifted through. Interestingly, it is often beneficial to leave sketches for a period of weeks before returning to them - time is often the best judge and decisions can be best made when the initial pride surrounding the finishing of a sketch has abated. At the same time a degree of organisation can benefit your sketchbook - leaving dates on your drawings, as well as a few words detailing the location they were drawn in and the intention behind the drawing will help you to make sense of sketches later on! When you have amassed a body of sketches, you naturally discriminate against more and less successful works. It will then be your inclination to make improvements to your work and it is in this way you will approach a level of expertise!